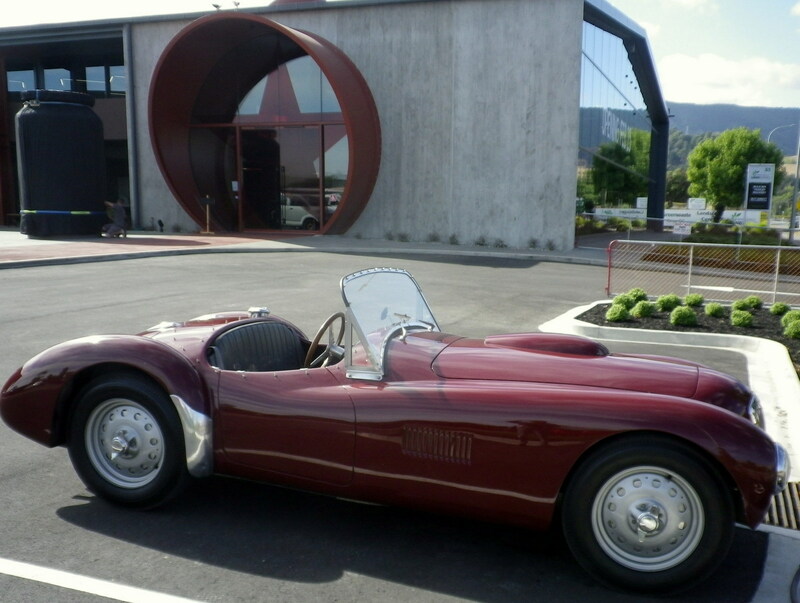 We planned a two-week trip to the Nelson area for late February before consulting with Mike Wilson at Cartel Works (that's the restoration business next to the WOW/Classic Car Museum in Nelson, where the Frazer Nash has been since 2011). 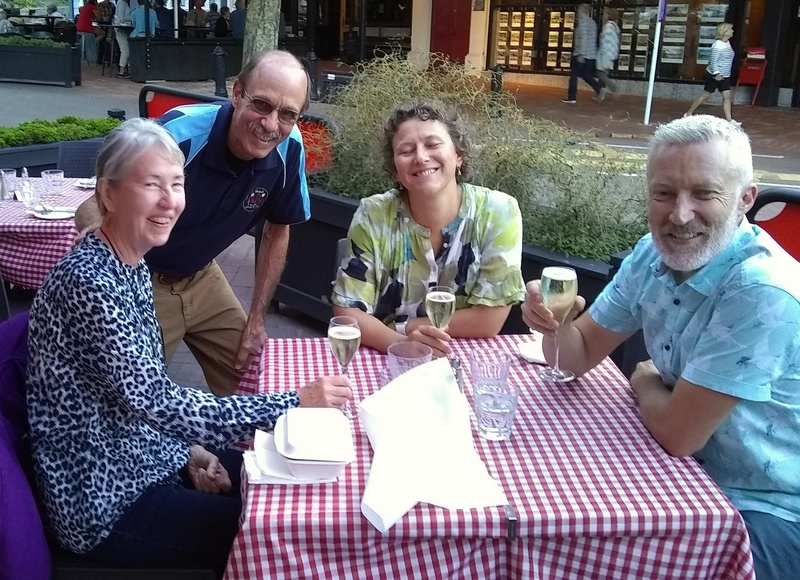 After we picked flight dates, we learned that Mike would be on vacation until February 16, so we decided to travel without the Frazer Nash for the initial time in New Zealand. Late on February 10, Shannon and I flew from Los Angeles to New Zealand on Air New Zealand, an airline used for most of our visits to New Zealand. We lost a day, crossing the International Date Line, arriving in Auckland, New Zealand on February 12. 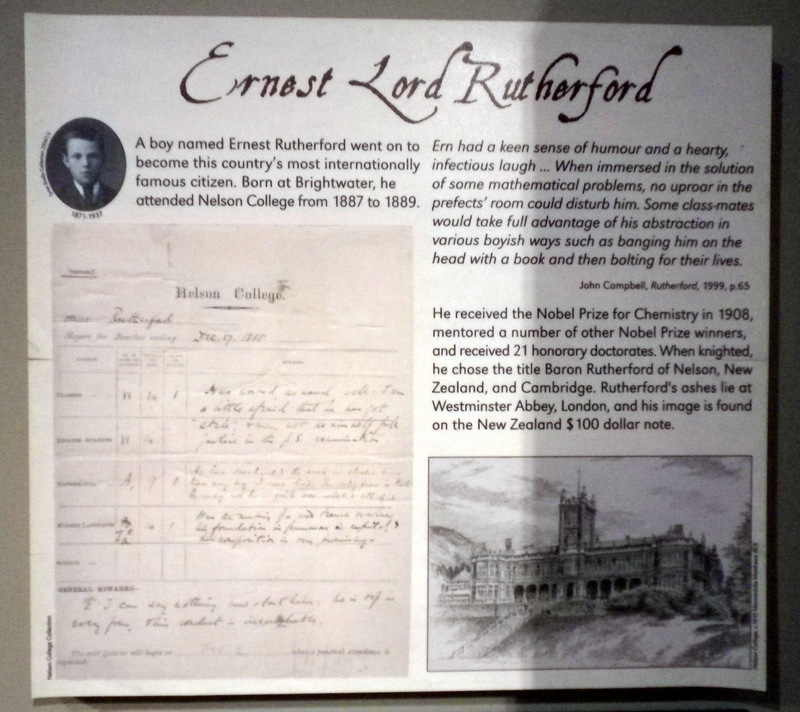 We had an invigorating walk between terminals and had a mid-morning flight from Auckland to Nelson. From the much-improved Nelson airport, we took a shuttle to the Waimarie on Riverside motel, where we've stayed previously. We had more than a day around Nelson, including getting great peaches and bread from the Nelson Farmer's Market on Wednesday. We also got a new Vodafone SIM card and updated our visitor AA card - adding extra emergency services! Also we made the short walk to the Riverside pool, swam laps and used the whirlpool spa - small extra charge! 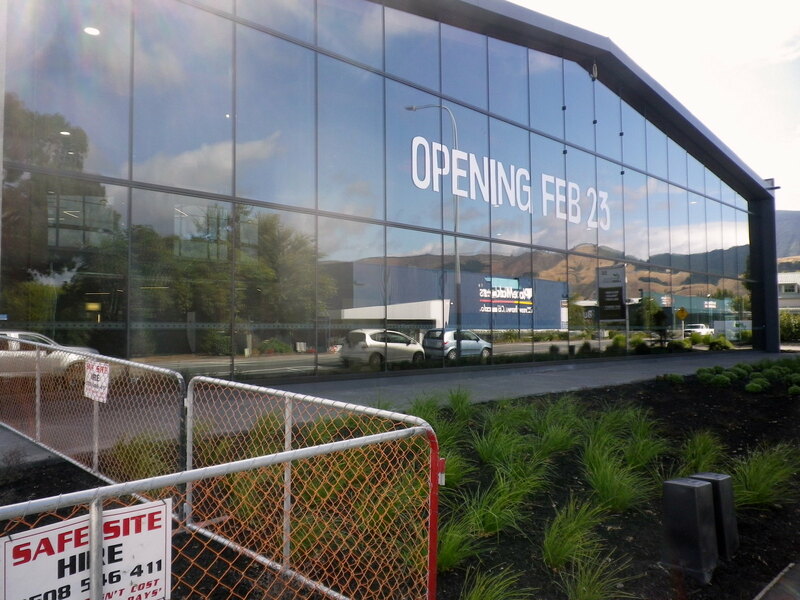 We picked up an Apex rental car just a few blocks from the motel on Thursday, February 14 and set off for Blenheim. The drive to Blenheim was familiar and nearly routine in a "modern" car. After negotiating the turns and hills on Highway 6, we covered the 45 miles to Havelock in about an hour. 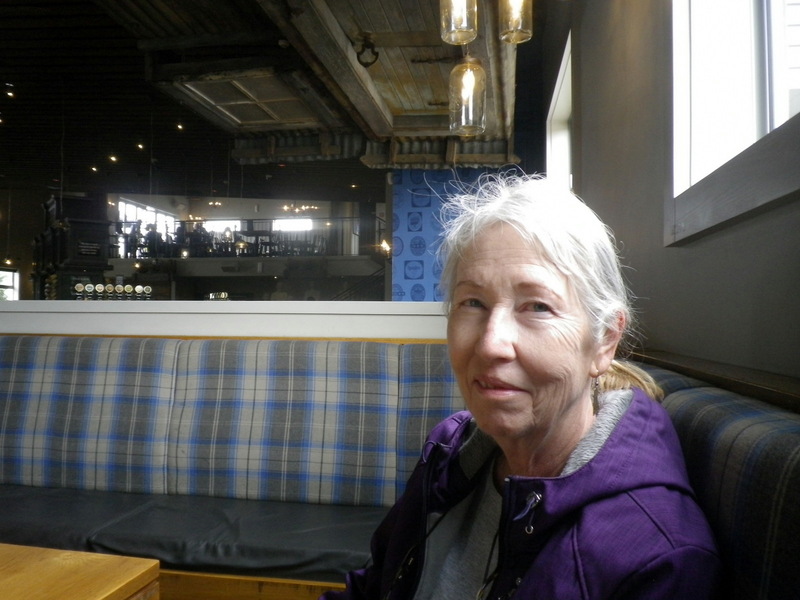 We stopped to see the Museum and had coffee and pastry at the Captain's Daughter. 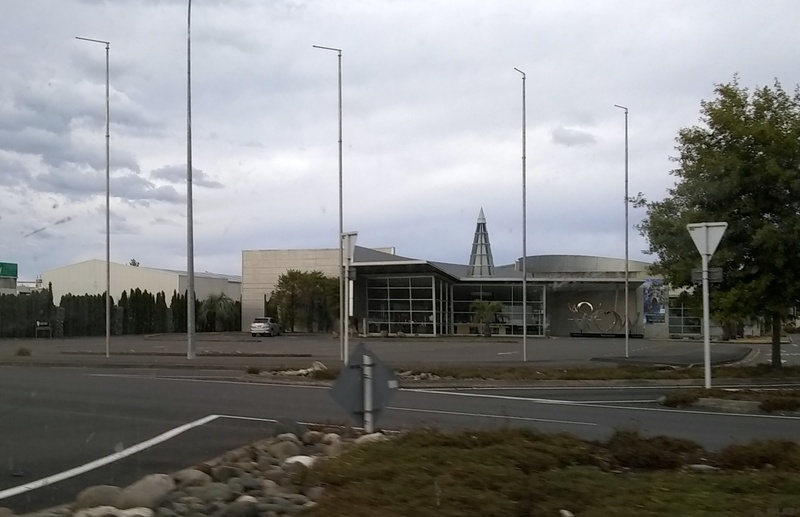 As we neared Blenheim with straight roads ahead, I thought we could make a brief stop at the Omaka Aviation Heritage Centre, planning for a full visit on Friday. I followed a sign south of the road, but nothing looked familiar, so rejoined the main highway. 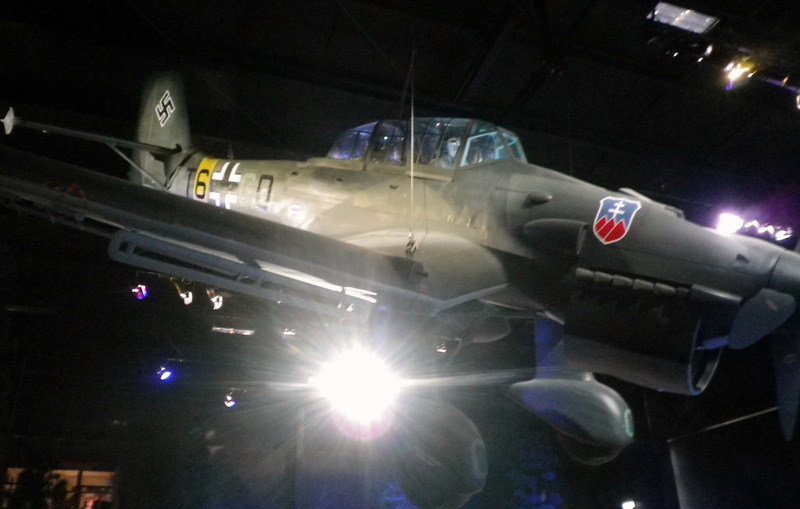 A few miles east, we saw another sign for the Aviation Centre and we finally arrived. Both routes would have worked! On a 2011 visit to the Centre, I had met Graham Orphan. the publisher of "Classic Wings" magazine after noticing a red Alfa at the Centre parking lot and inquiring about the owner. So I asked if Graham was around and we had a brief meeting with him. He mentioned one of the craftsmen working on the aircraft restorations had formerly worked for Jay Leno on Jay's Merlin-engined Rolls-Royce. Small world! 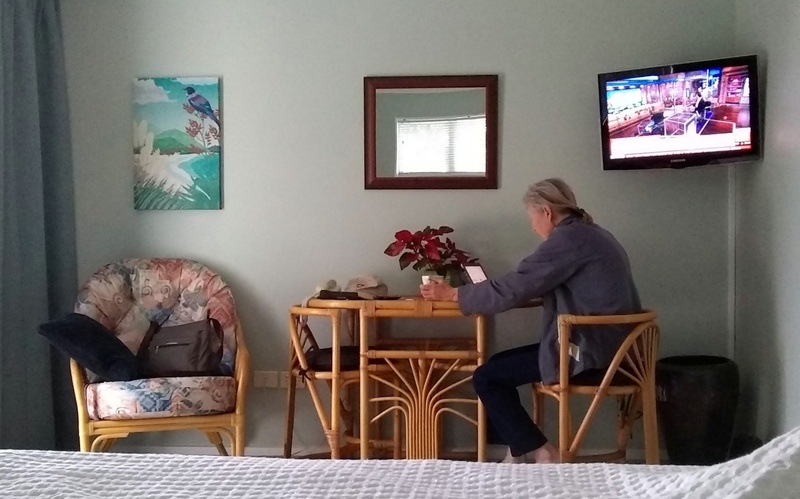 We then checked in the Admirals Motor Lodge and headed to Blenheim City Center. 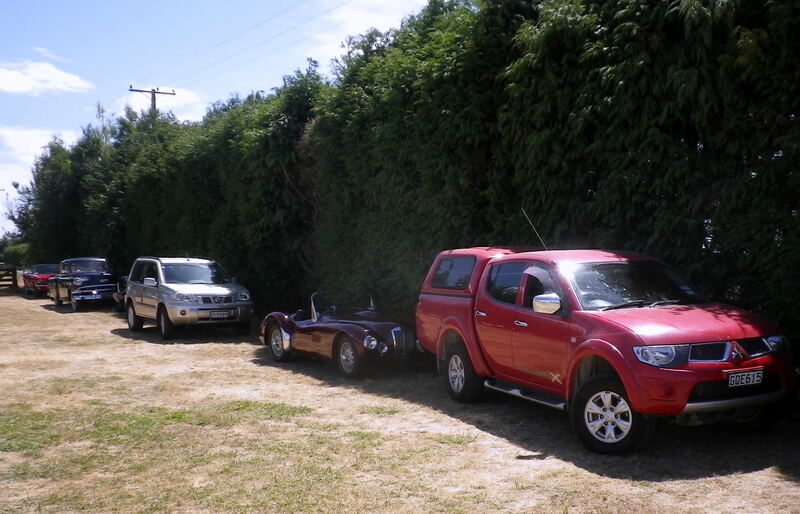 I stayed at this motel in 2011, when returning from Auckland with the Frazer Nash. It's a long story... Also, from previous visits to Blenheim, I recalled a scenic path along the Taylor/Opaoa River. We parked and walked along the river; one goal for the walk was to locate a spot for a Valentine's Day dinner! We found the Saveur Cafe, Bistro & Patisserie which had a nice outdoor terrace, but decided it was too early for a dinner. 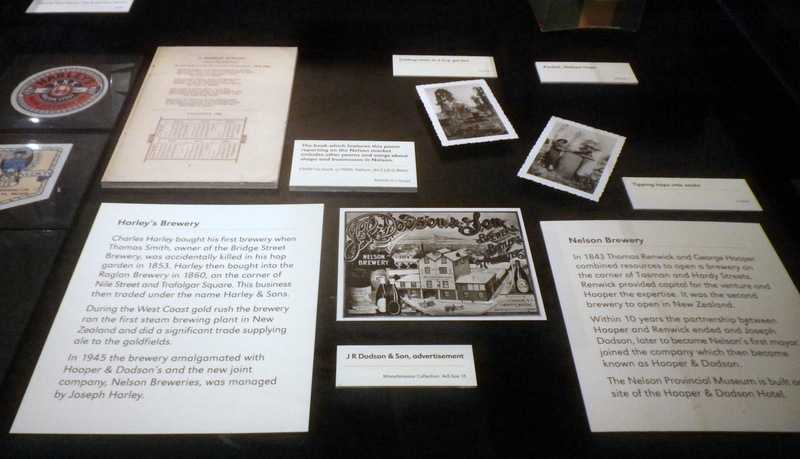 Shannon said she had noticed a Speight's Ale House along the route to Blenheim, so that was the spot for our dinner. 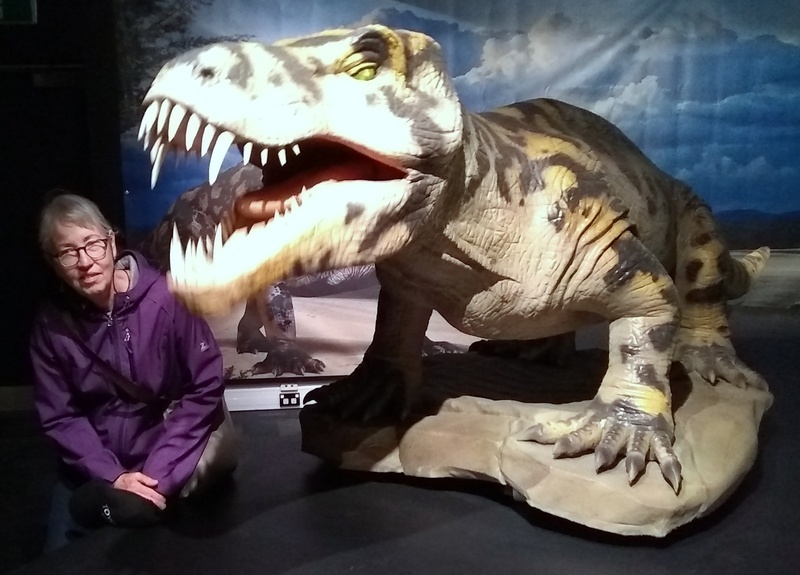 We planned a visit to the Centre as the highlight of February 15 and it did not disappoint! 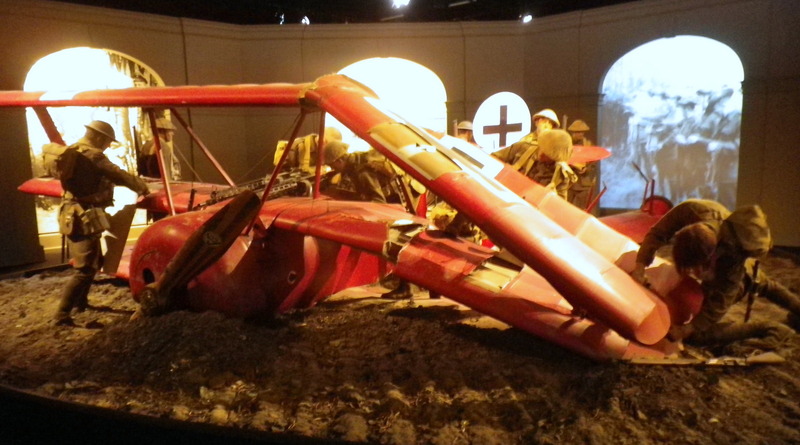 Since my other visit in 2011, the Centre has expanded to include great exhibits and history of WWII aviation, emphasizing New Zealand's and Great Britain's role in this conflict. We had dual entry to both exhibits with a senior discount! Here is a link to a video walk-through. 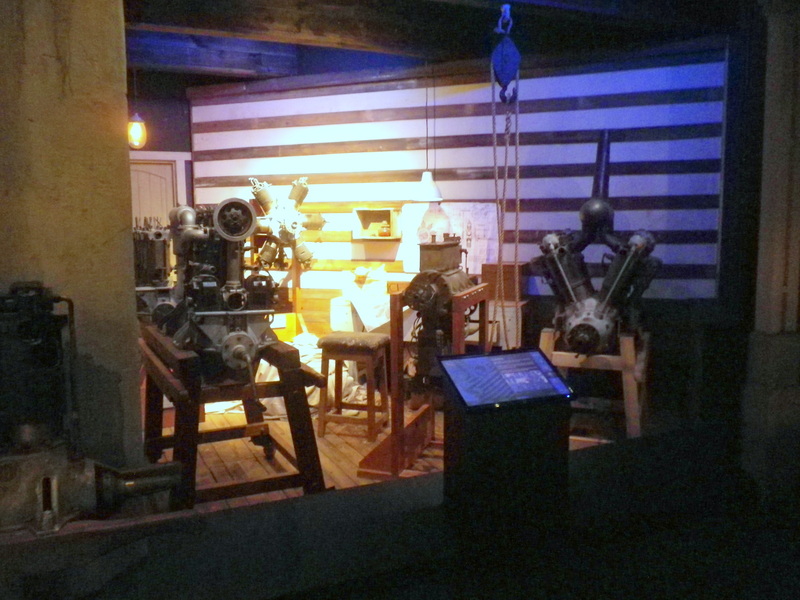 Aircraft engine exhibit with an interactive guide. Much to learn if there was more time! A plan to visit the Spy Valley winery just 10 mile west was postponed by a cautious need for health checkup. All was fine and we had nice walk along the highway from the motel to a "superstore" for travel snacks, then a final night at the Admirals Motor Lodge. We checked out of our Blehneim motel at 8:30; the Admiral's Lodge was a nice place with a good location. I had never gone much further west from Nelson on prior visits and a reason for the rental car was to lessen the drama of the (apparently) challenging road to Takaka! The travel time was forecast to be nearly 4 hours for the 150 mile journey. 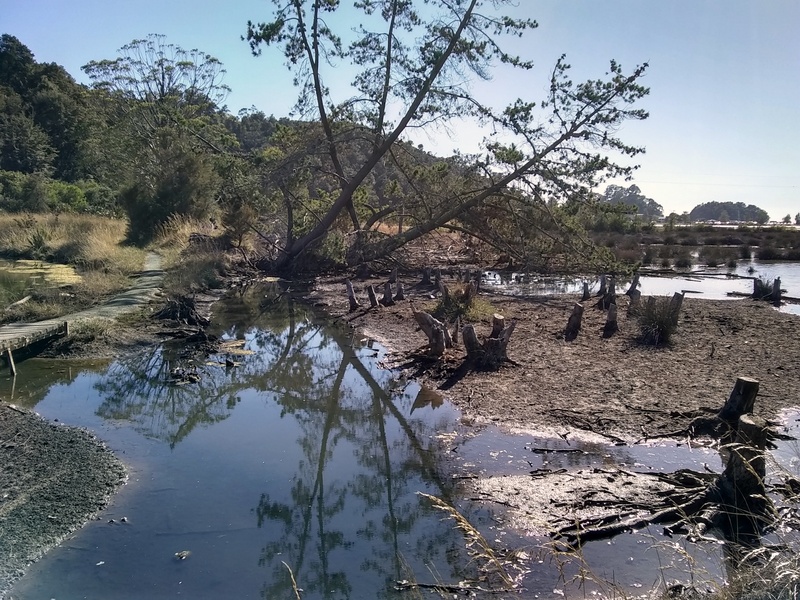 When we reached Havelock, I set up the GoPro the record the route to Nelson and Cartel Works. Here is the one hour+ video, perhaps too long?. Since it was on our route, we stopped at Cartel Works (WOW/Classic Cars Museum), unsure if was open this Saturday. Jordan was there and so was the Frazer Nash, ready for the road! "Takaka Hill, as many other areas in and around the Golden Bay, has also been the location for many scenes filmed for The Lord of the Rings film trilogy." 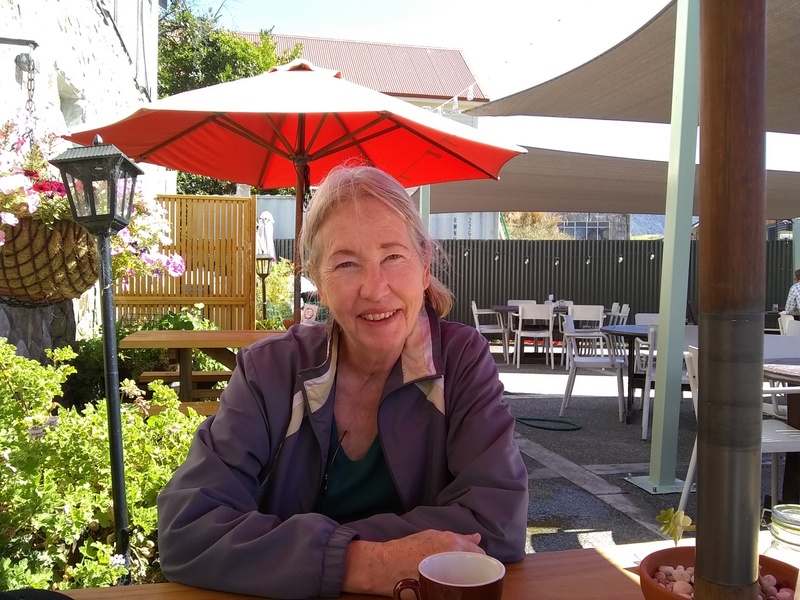 and the road is listed on the "Dangerous Roads" website although the site states: "Takaka Hill isn't a scary road, but it is a very steep and winding road." What we did not know in advance was the road was single-lane for several miles due to a landslide almost exactly one year ago. The landslide was caused by rain from a cyclone; it entirely cut off Golden Bay from the rest of the Tasman region, stranding tourists and residents. Many used light aircraft and water taxis to leave Golden Bay until the highway re-opened. The single-lane direction is now controlled by traffic lights, with waits forecast to be not longer than 20 minutes. When we got the green light, we let a motorcycle get ahead of us and led a small convoy up the hill through the many, many turns. 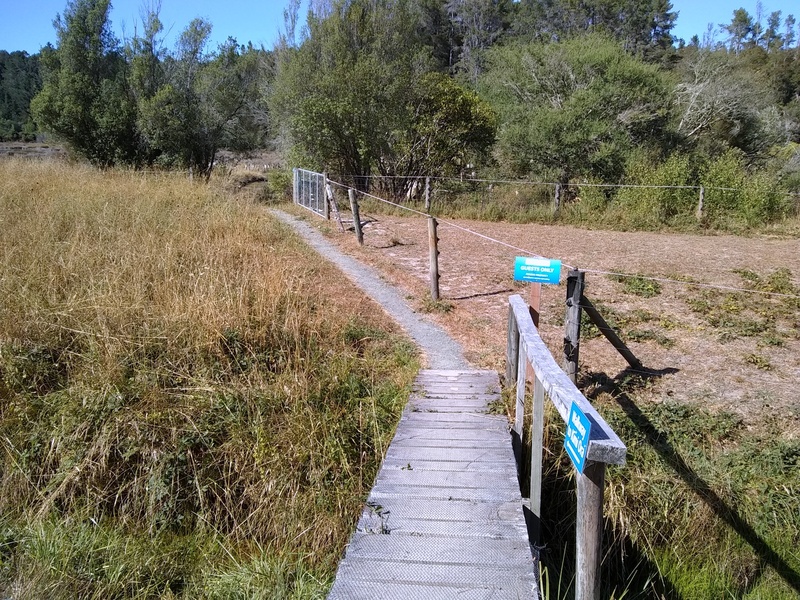 Eventually the road straightened out, but it was still 10 miles to the town of Takaka and 15 miles from there to the Zatori Retreat. 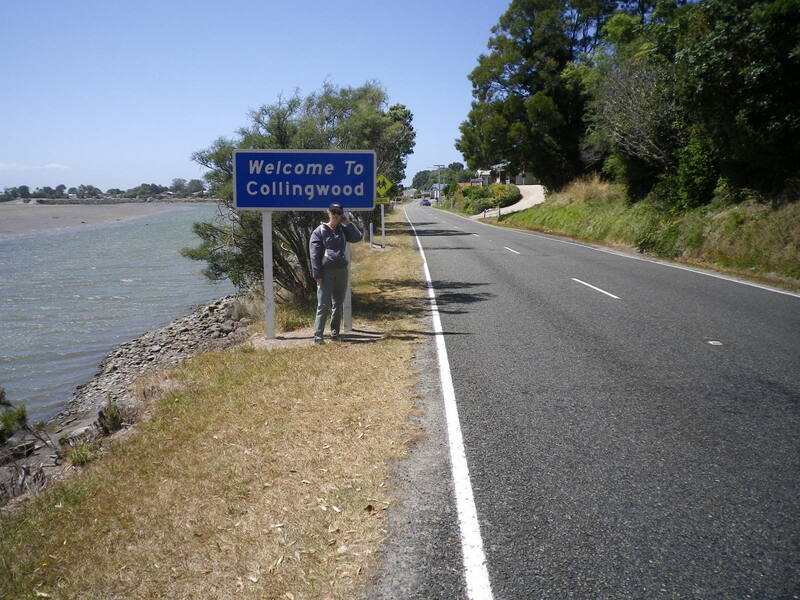 We fortunately spotted a sign for the resort where road split between directions to Collingwood or Farewell Spit. Check in at 3 pm was easy. Not knowing the area at all, I had the vague idea of driving to Farewell Spit, but was advised it was 40 minutes each way! Not feasible. 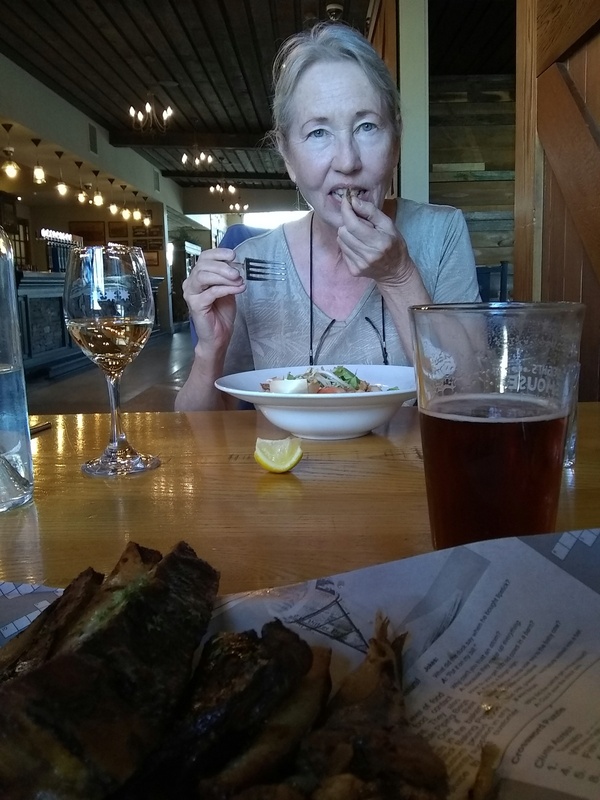 We were also told that it was just a 15 minute, 1/2 mile walk to Collingwood with several places for dinner, including a "food truck" at the end of the road! 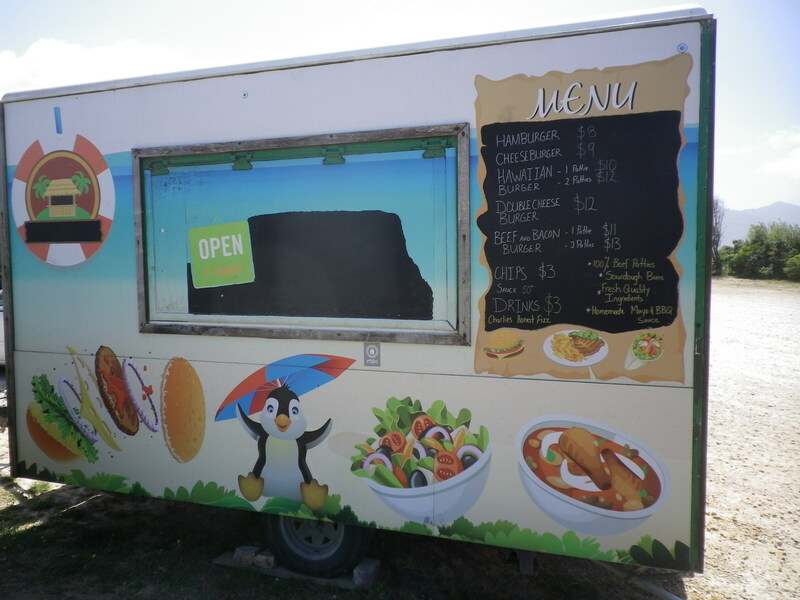 The promised food trailer, not open! We saw more of Collingwood on the walk back and had a nice dinner platter at Zatori. Breakfast the next day was enormous and great. In summary, Zatori was worth a visit but if a tour of Farewell Spit is desired, plan on two nights in Collingwood. The tours to the Spit are 6 hours! After saying farewell to the friendly Zatori cat at 10 am, we were soon heading south to the Kimi Ora Eco Resort in Kaiteriter, our next stop. Shannon was shocked to learn there only way there was the way we had come - just one road with many turns. We turned on the GoPro for this segment - here is the a video of the drive. 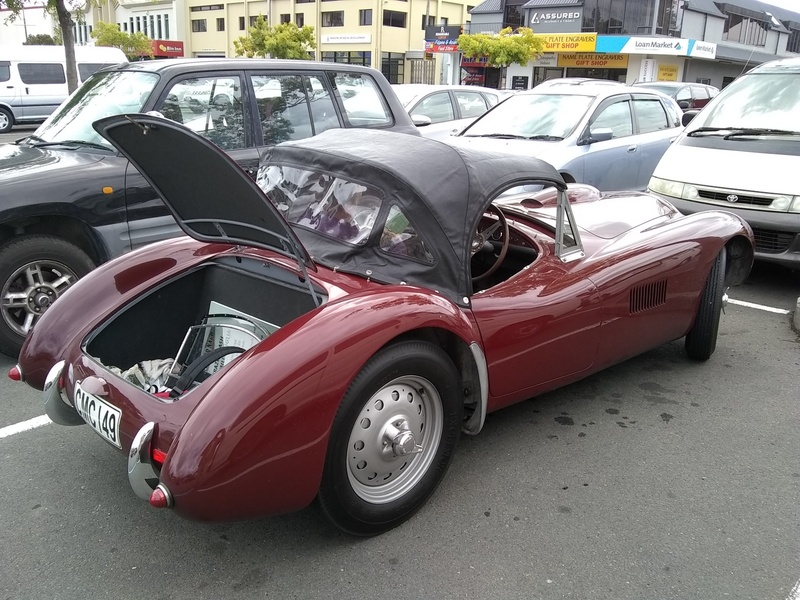 Some years previously, I wandered into Kaiteriteri with the Frazer Nash, so the end part of the drive was familiar after negotiating the Takaka Hill Road. Shannon had booked Kimi Ora on the promise of a spa with the usual treatments. It also claimed an indoor-outdoor pool and both indoor and outdoor spa pools. After the many twists and turns, the last part of the drive was easy. Kimi Ora was separate from most of the Kaiteriteri attractions and eventually located after noting its map location, but up a narrow and steep road. We had a nice room with a great view. It was Sunday night - the dining room was closed! So we went into "town" for dinner at "Gone Burgers" - burgers, of course, quite good. Beer and wine from "On the Spot" to take back to Kimi Ora and we were all set. On Monday, we used the pools and spas and then walked a trail down the hill from the resort, intending to get to Kaiteriteri shops. But a trail across the road was closed because of the area drought and fire danger; the long loop of the road seemed a bit far, so we headed back to the resort. Shannon was also scheduled for a session at the spa. 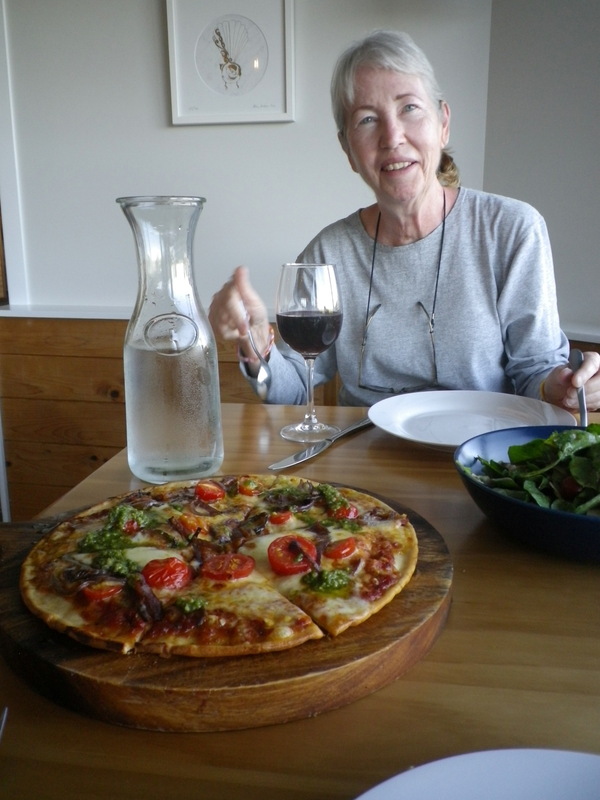 Monday, February 18, was "pizza night" at Kimi Ora and we enjoyed it very much. 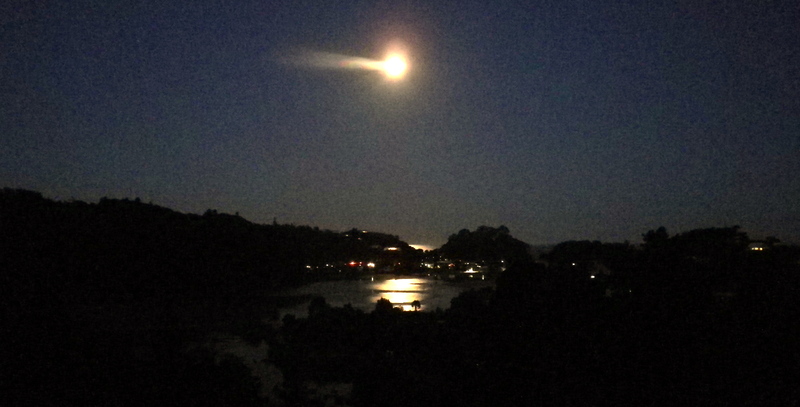 There was a full moon that night - our room had a great view. Except for the relative isolation at the resort, we enjoyed Kimi Ora very much. 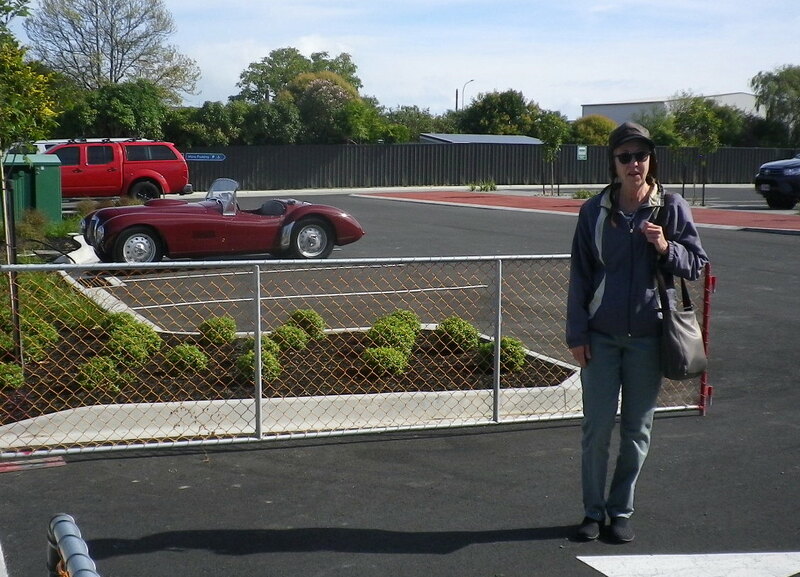 We were due back at the Waimarie motel in Nelson on Tuesday, so started the 45 mile, one hour drive after checking out. 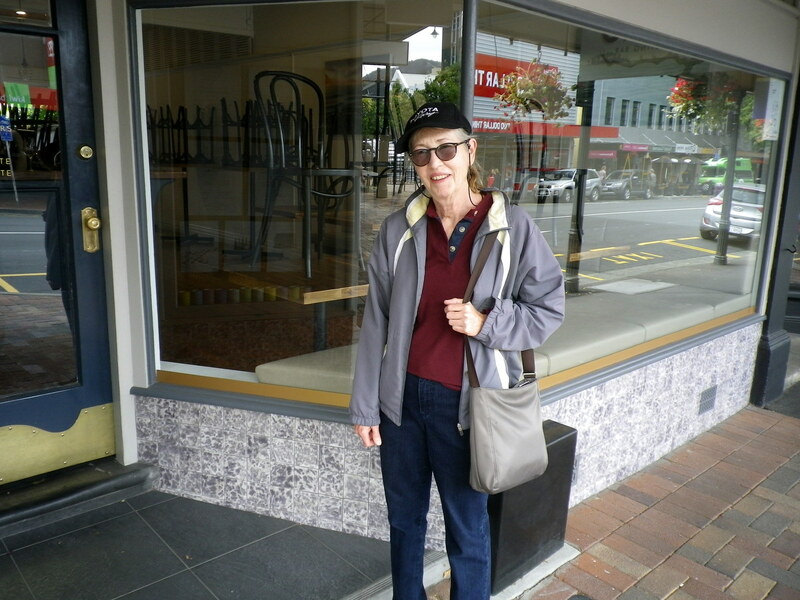 We stopped in Motueka for shopping on the way - it's a charming town! The Apex rental car was not due until Wednesday, so we explored more of Nelson - the Suter Cafe and Queen's Park. Wi-fi at the Waimarie was still faulty, so we walked to along the river to the Nelson Library - many books and magazines - and a strong wi-fi signal! The rental car was dropped off early on February 20 then we met with a IT tech at the motel to check out the wi-fi signal. He declared it "weak"; we were later told the Waimarie would accelerate a wi-fi upgrade. There was a very strong signal on Friday. After the tech session we went to the Farmer's Market for more bread - and apricots! Mike told the Frazer Nash was ready to go and offered to pick us up. I knew they were busy and thought we could easily take the bus to Cartel Works. Just a short walk to the bus terminal and $2 each for Bus #1. It dropped us on Annesbrook Drive, a downhill walk to the museum and Cartel after good advice from a fellow passenger. The Frazer Nash was ready for the road! We drove back to the Waimarie and then walked again to the Riverside pool for a swim and a soak. 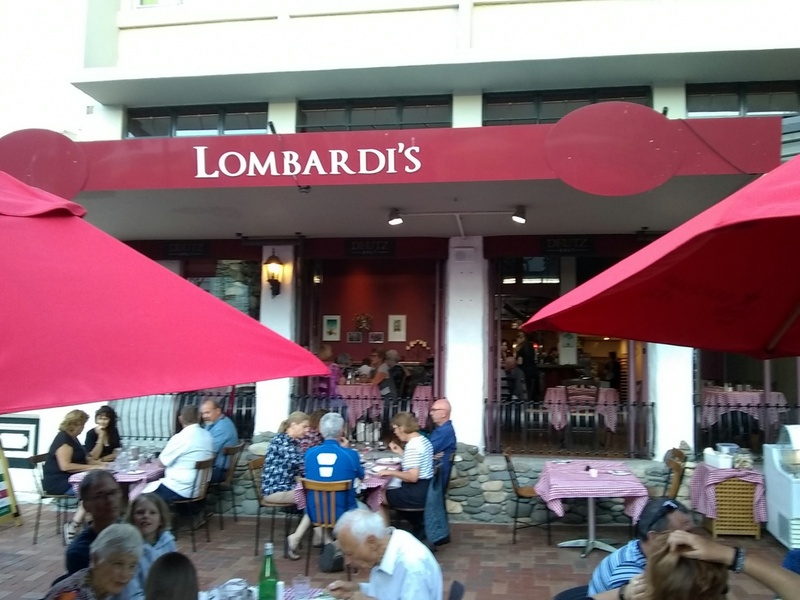 That evening we met Mike and Lizzie for dinner at Lombardi's, just a short walk from the Waimarie. A great dinner! 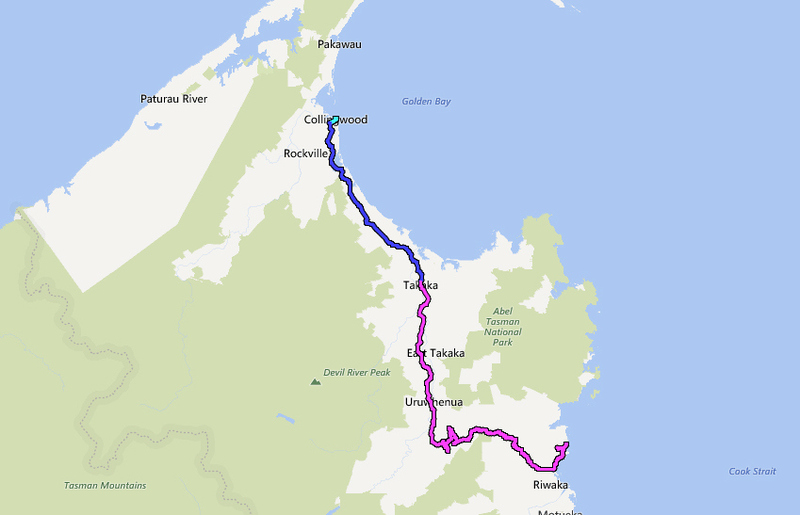 Mike suggested that Mapua and the Ruby Coast would be a good destination for a Frazer Nash drive, so that's where we headed on Thursday. Just after starting, I noticed the brake pedal was slow to release. Was it the brakes or the pedal? We stopped for gas at a BP station where I checked the wheels for hot spots, which would confirm a dragging brake. All seemed normal so we continued to Cartel Works. Mike jacked the car up and checked the master cylinder (under the driver's floor). It seemed the rod from the master cylinder was off-center, possibly because the rubber boot was missing. Mike suggested grease on the shaft could be a temporary cure and a test drive confirmed normal pedal release. We headed to Mapua and got there in less than an hour, only one false turn on the local streets! 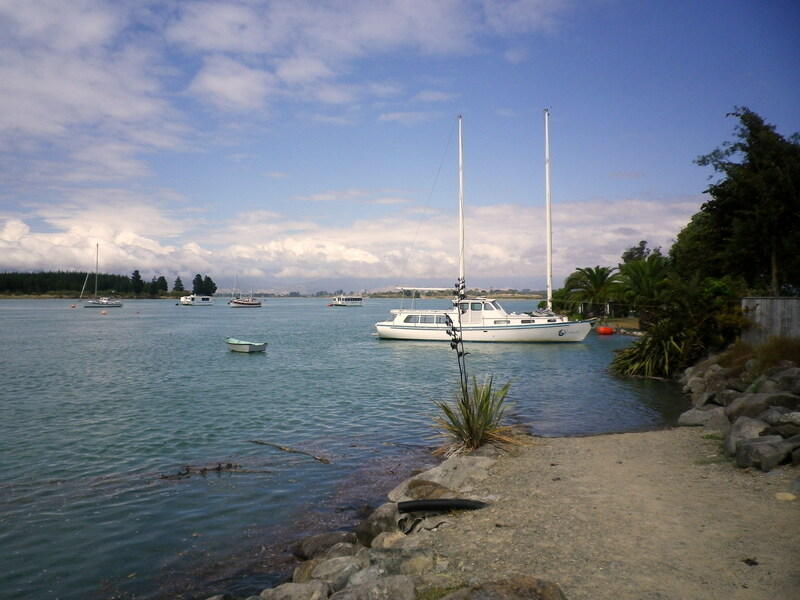 We walked through the small town to the Mapua Wharf and enjoyed great views of Waimea Inlet. 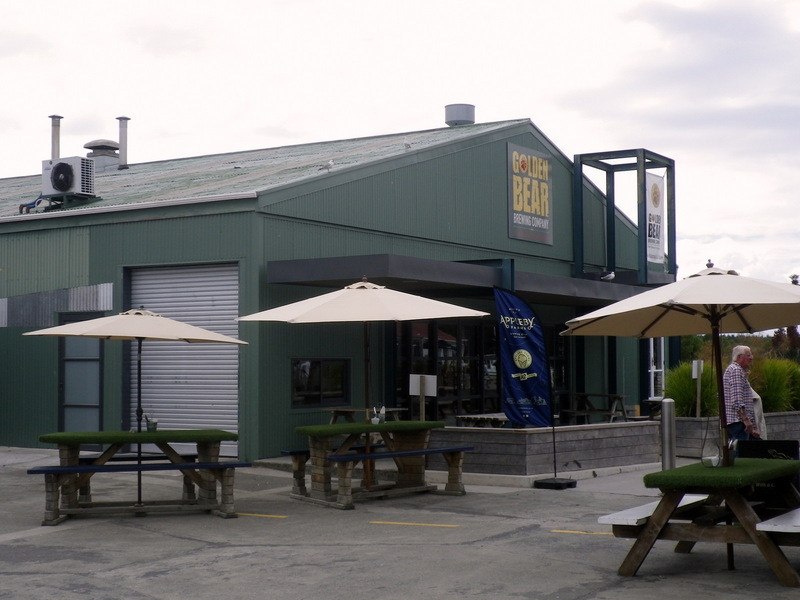 Just around the corner from the wharf was the Golden Bear Brewery - not open until much later! We had chicken sandwiches and a chocolate shake at Albert's, an outdoor cafe, checked curios around the coffee and then Shannon got a custom grind of decaf coffee at the Rabbit Island Coffee, where they roast their own. We continued down the wharf road, went uphill through the park and noticed two Frazer Nash admirers when we looked for a fence opening. One guy had seen the car while riding his bike when we were on the wrong road. 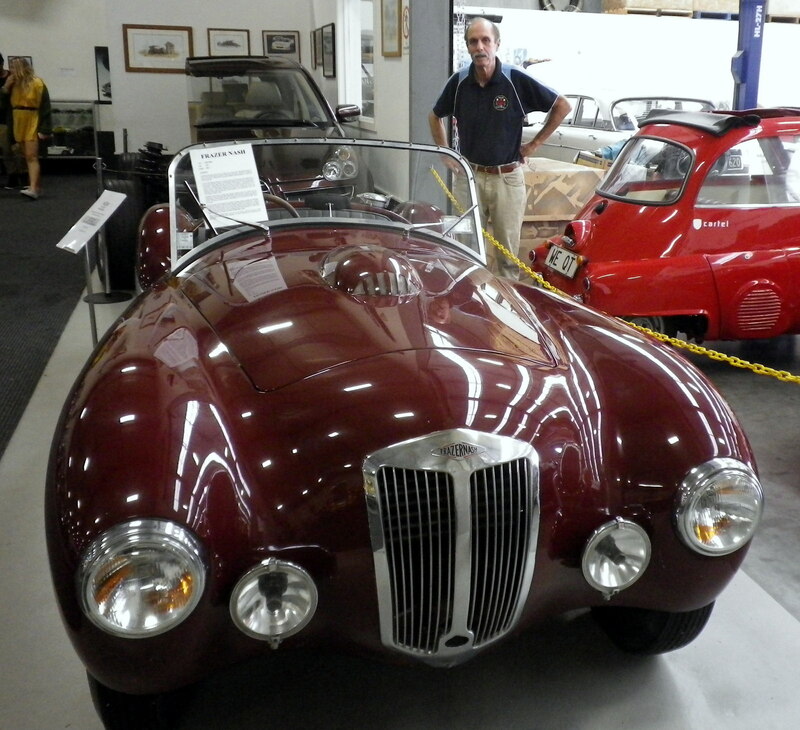 He went home, got in his blue XK-E and went to the "tourist area" to find the Frazer Nash - our car. We had a nice 1/2 hour chat, then it was time to head towards Nelson. 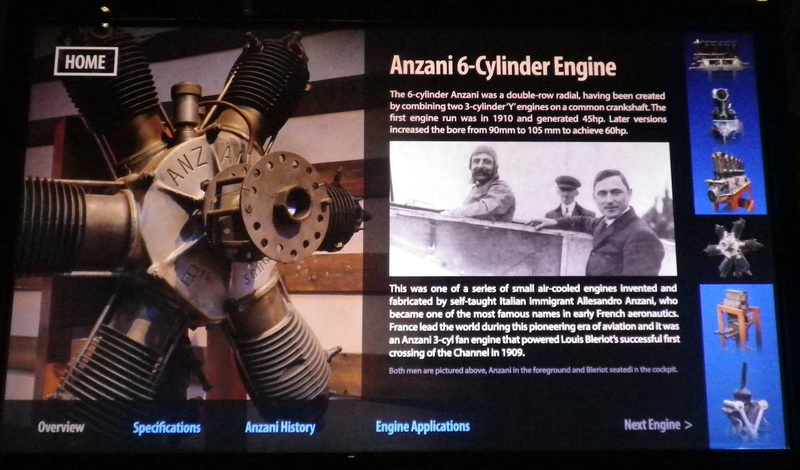 On a prior visit to Nelson's motorcycle museum (alas, since moved to Invercargill), I learned about Richard Conlon, a coachbuilder who had done a spectacular restoration of an antique motorcycle and sidecar. I did not have an email or phone for Richard, but his shop location was in my Garmin GPS. I have a general idea that his shop was near our route back to Nelson, so trusting the GPS, off we went. 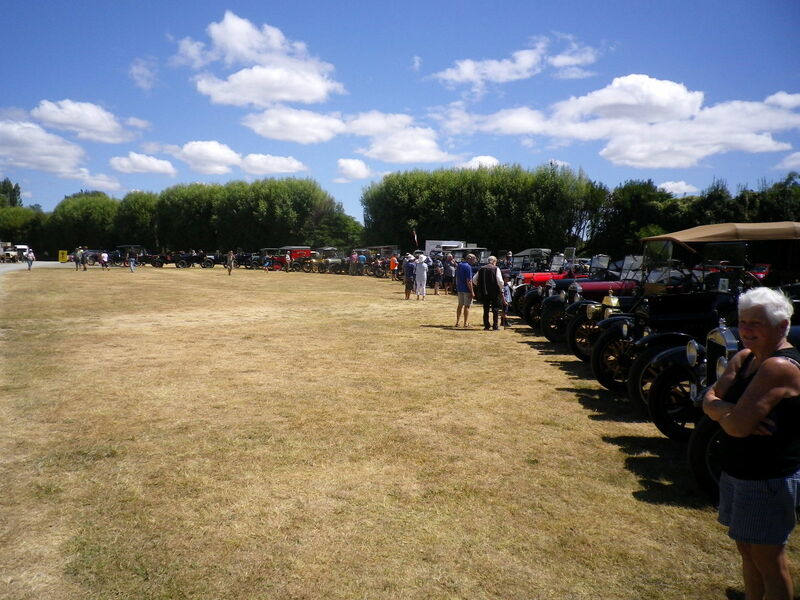 The GPS got us very close, but was difficult to read in the bright sun so we unknowingly drove a short distance past Tasman Coachbuilders, did a U-turn and were soon greeting - and Petrus du Plessis, who I met more than 10 years earlier when he worked at Leitch Motorsport in Invercargill. His wife Heather had been re-located by her audit firm to Richmond and Petrus landed with Rcihard. Small world! 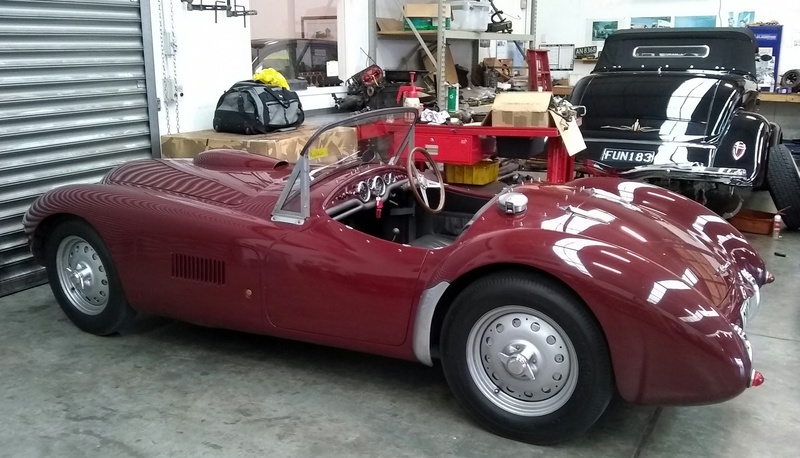 Richard showed us his nearly completed MG-TA and Petrus told us about his next project - a classic '20s speedboat! By 3 pm, we were headed back to Nelson. 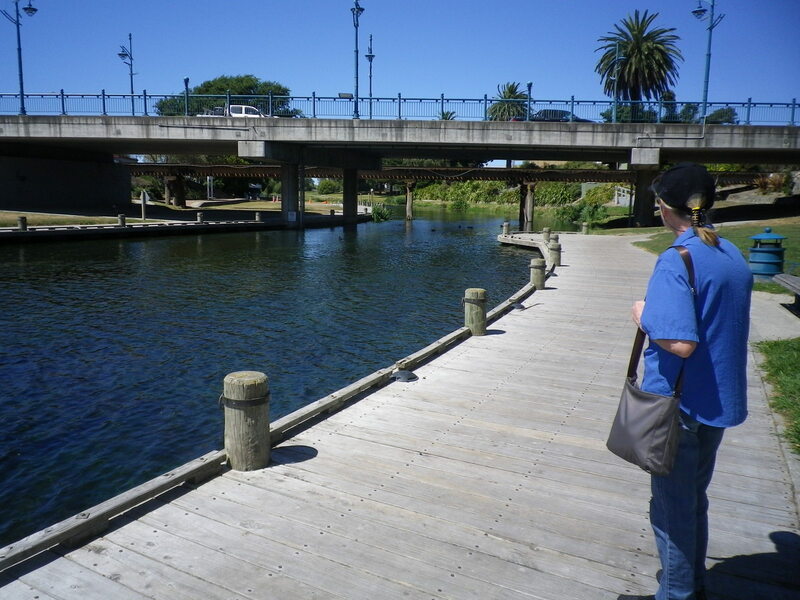 This was the day our room would be changed at the Waimarie, so wanted to check it out and plan for dinner. Also, we had been carrying around a bottle of champagne since February 14 and needed a plan for that. Our new room had a nice balcony, so we invited Mike and Lizzie to share the bottle with us and have another dinner. Mike and Lizzie led us on a walk to Arden Bar & Kitchen, a restaurant specializing in unique "small plates". We had a little wine and many plates - it was very enjoyable! We had seen signs on Highway 6 several times driving to Cartel Works for "Pic's Peanut Butter World" and surmised it was a tourist attraction for Pic's Peanut Butter, which I had found in Nelson on an earlier visit and brought to Burbank - great peanut butter! I wasn't sure it it was open or "coming soon", so we headed from Nelson, past Cartel Works toward Richmond and took the sign for Saxton Road. We went around the roundabout too far and wound up semi-lost on Nayland road. Fortunately, we were followed by a classic car admirer who wanted a closer look at the car then set us in the right direction. We were a day early! We still planned of getting to the Ruby Coast, but I thought to take advantage of a BP station in Richmond where I could get the recommended 98 octane fuel. It was just a few miles away on Queen Street and Salisbury Road. We did not need gas, but it seemed like a good idea, but wasn't! I ran into a car enthusiast who visited Jay Leno's in 2018 and we chatted for a bit. The Frazer Nash had sat a while, possibly felt neglected and was immediately running badly. A clog from junk in the gas? Overheated ignition? In any event, we continued down Queen Street, turned north on Highway 6 hoping for a smooth running engine, but there was no improvement. We turned back to Cartel Works with an engine that did not smooth out so limped in to the workshop. 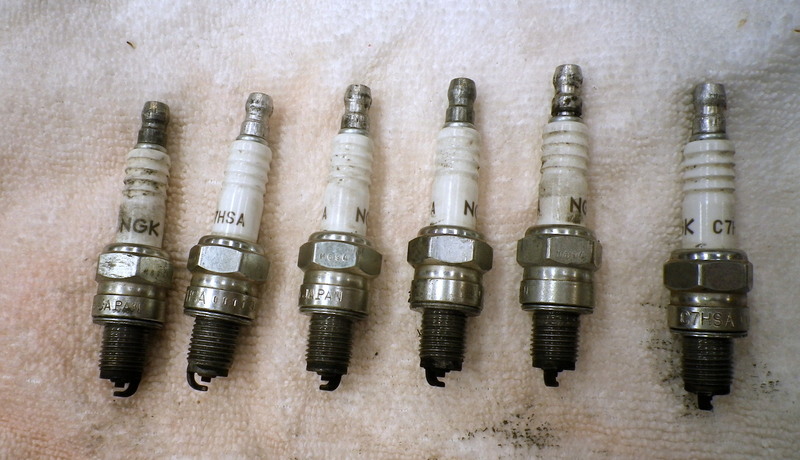 With nothing better to do, I looked at a few car in the museum collection while the car cooled, then cleaned the plugs, using the plug wrench in the car, one of Mike's tools and help from the Cartel guys. When all was done, we had a tea break with the Cartel guys that included WOW pastries. Too late for anything else, we decided to head back to Nelson and used the scenic Golf Road, which took us by Kentucky Fried Chicken - more food for the room! Walking through Nelson later, we went by the Arden Bar & Kitchen, took a photo of it and a Motel T in Nelson for a club gathering. Inspiration for Saturday! Model T on the loose! 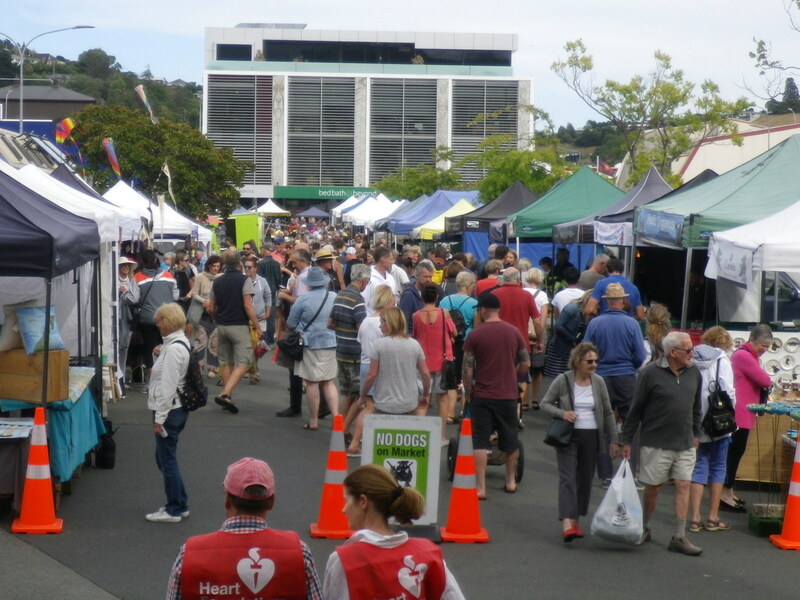 Saturday morning started with a walk to the Nelson Market, a Saturday morning event that we never miss. It was crowded and fun! I could not find Golden Bay liquor purveyor Terry Knight, who I had chatted with in previous years - and still have partly filled bottles that I had bought years ago. I later learned he now has the Golden Bay Distillery a few miles from Takaka and does mail-order sales. Back to the motel and we were off to the Nelson Speedway with the Frazer Nash to see more Model Ts! 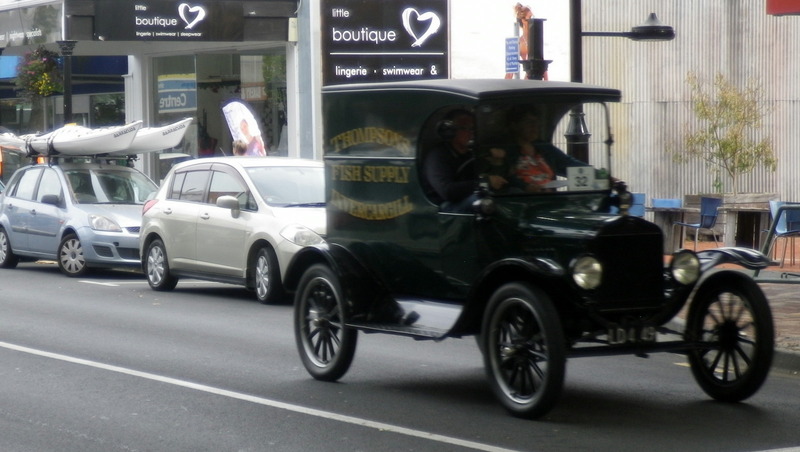 In Richmond we saw a Model T turning down Lower Queen Street at a McDonald's - where we had eaten a few days earlier. 2.5 miles down the road, we were in the Speedway where about 50 Model Ts were on display or running an obstacle course. Model Ts "as far as the eye can see..."
We cooled off in the Nelson Brach clubhouse which was given over to the Model T club members. When we went back to the Frazer Nash. we were greeted by Branch member Tim McDowell. 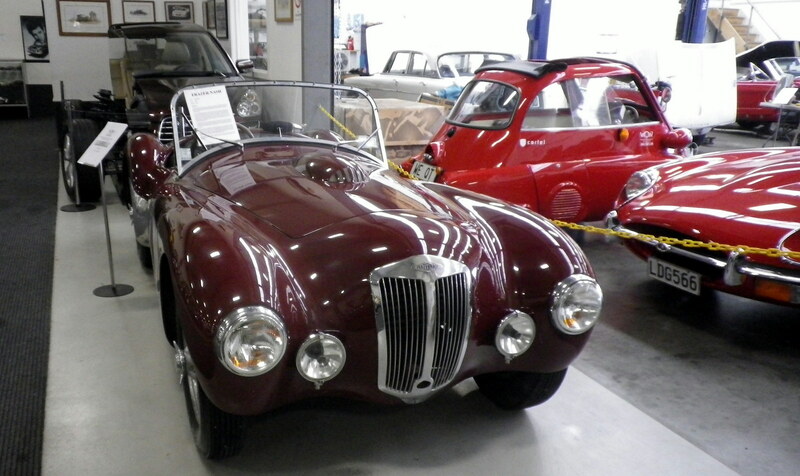 I met Tim nearly 8 years ago, when I stopped at Rollo's Locksmiths to get an extra key for the Frazer Nash. 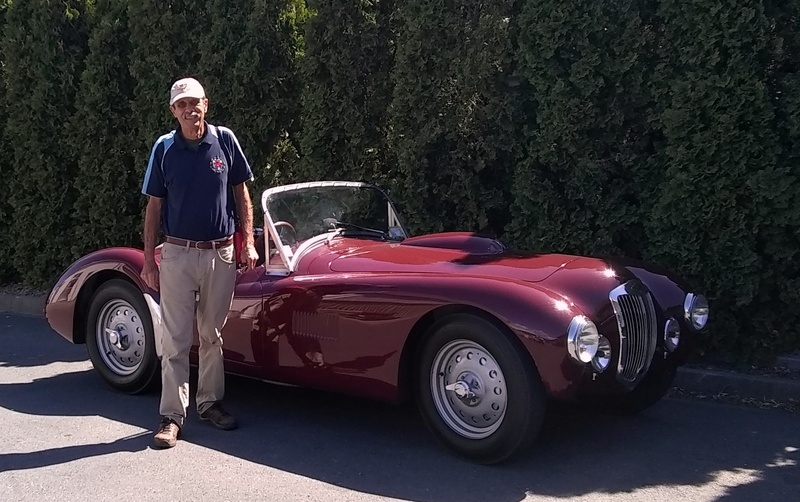 Tim recognized the key as belonging to an old British sports car and we found a mutual interest in old cars. 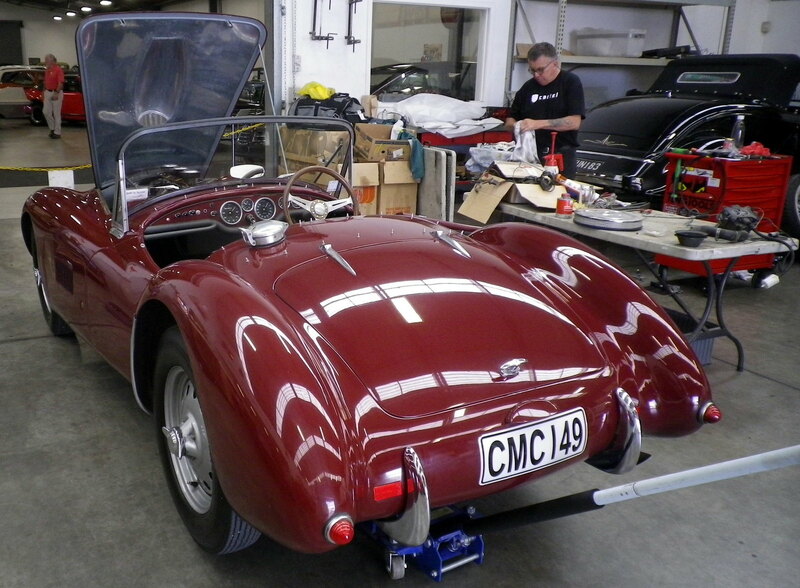 Tim now trades as Tasman Lock n Safes and still has classic British cars. 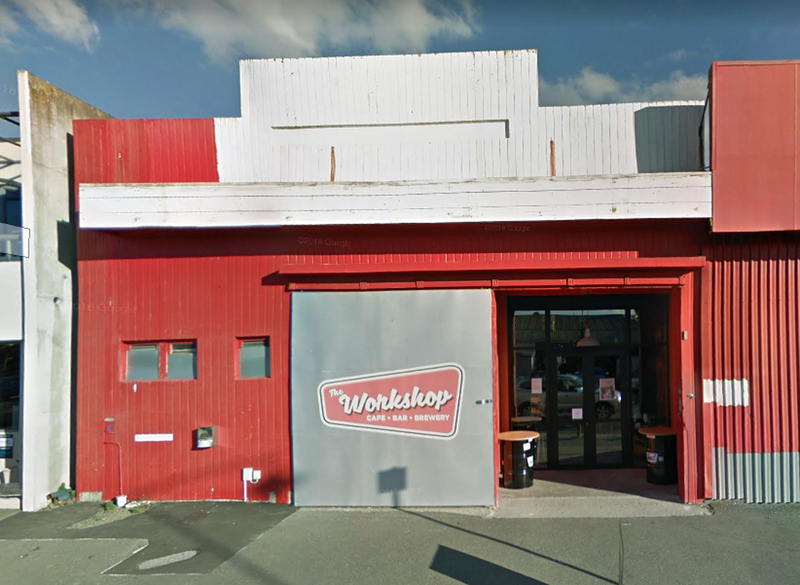 We drove back to the Waimarie motel and then a short walk to the Workshop Bar and Brewery, possibly the smallest brewery in the city! We had passed by this place several times and looked in once when it was too early for beer. But this was the right time and I was pleased to see they had a car sitting over the bar and "real ale" so I tried a 285 ml glass. Very good! We knew Sunday would be our last day - rain was forecast! 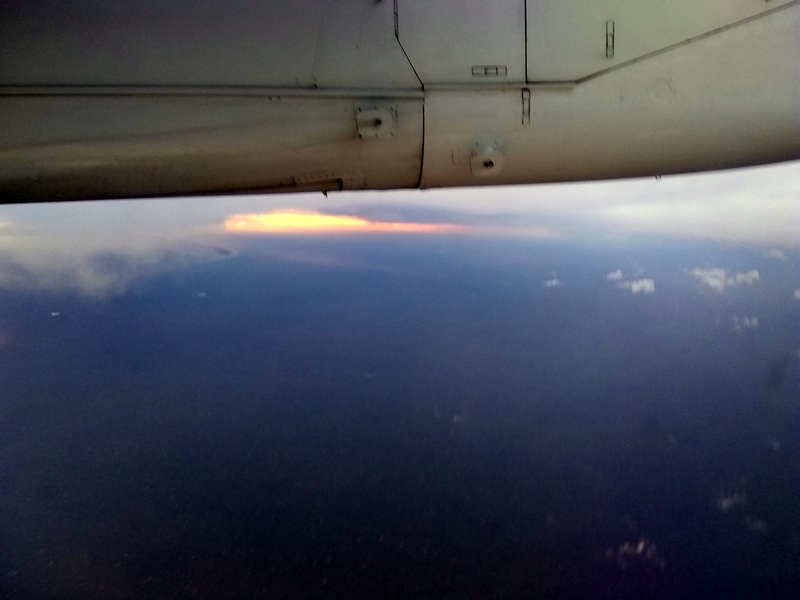 Our flight from Nelson to Auckland was not until 8 pm and we had few plans. We previously requested a late checkout and were told noon was OK. But the guest promised our room arrived early and we were moving luggage as the room cleaning started. The haste caused a nearly full bottle of wine, destined for Cartel Works, to be left behind. The light rain caused a need to put up the top; this did yield more room for luggage. 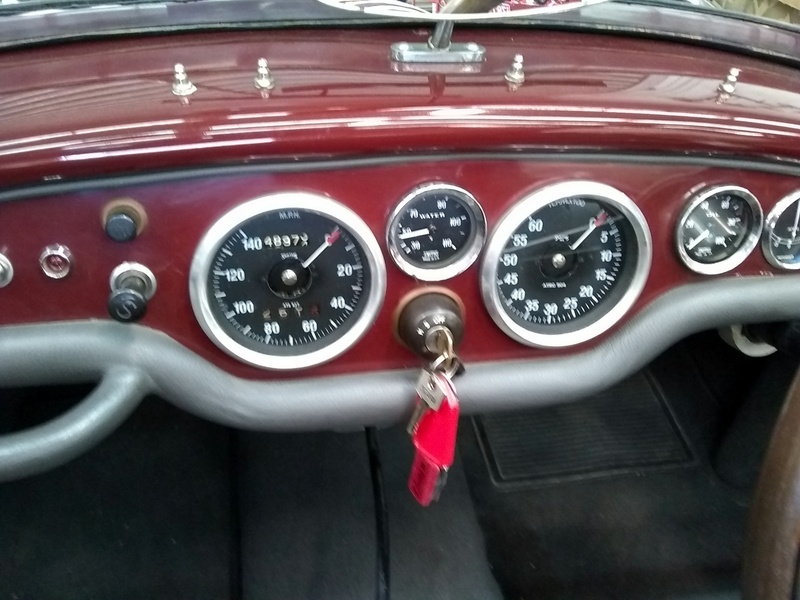 We dropped the bags at Cartel Works, had a light snack at Speight's Ale House across the road from the WOW/Classic Cars Museum, then drove back to the Nelson Provincial Museum with the top up and wipers working well. I had been to this museum years previously for a special Leonardo da Vinci exhibit. 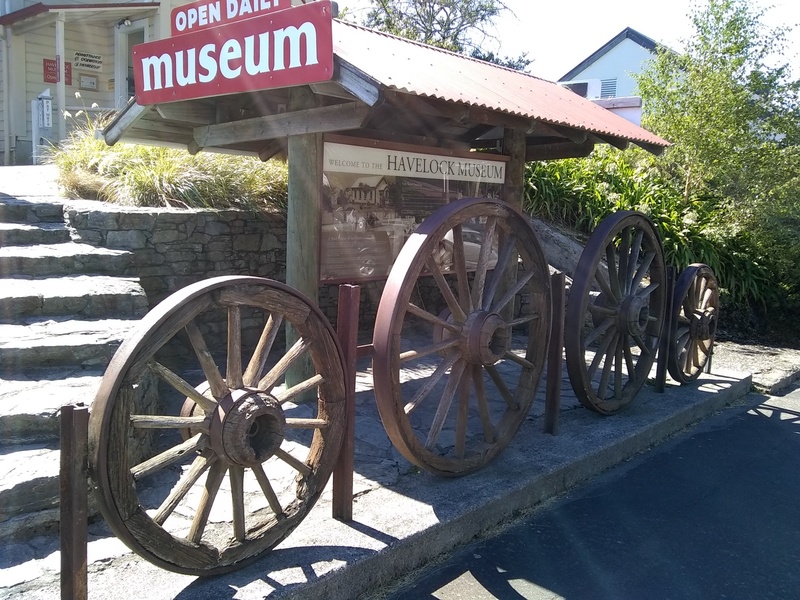 We had seen many signs for the current "Dinosaurs" exhibit; we also wanted to see their permanent exhibits on Nelson history. 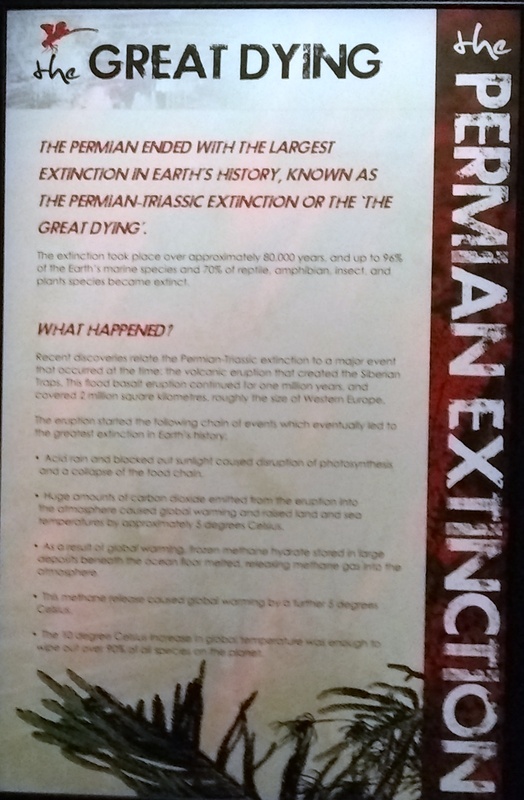 We saw much Nelson history, dinosaurs and explanations of Permian-Triassic extinction! So we hopped in the Frazer Nash for a last drive to Cartel Works and met Mike and Lizzie there about 4 pm. 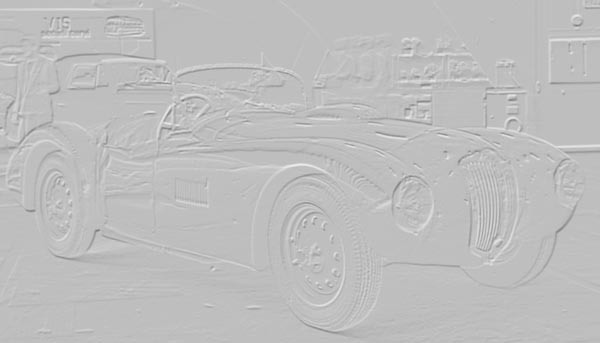 This is the last video of the Frazer Nash driving from Cartel Works to the Nelson Museum and back to Cartel Works. 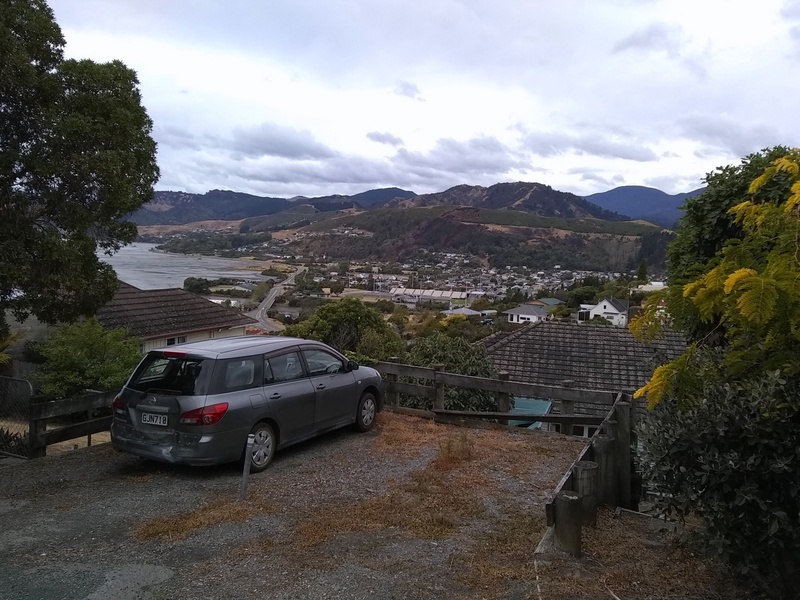 We had a little time with Mike and Lizzie at their house above Nelson - great views! Too soon they took us to the airport, and drove by WOW/Cartel Works. Check-in was very efficient - we got all our boarding passes and our luggage was checked through to Los Angeles. The remodeled airport is very nice, but both coffee shops closed much before our flight boarded! The photo below is Farewell Spit - finally got to see it! A few more days driving the Frazer Nash would been much appreciated - there were other areas we wanted to visit. Hopefully it won't be too long before we take another flight to New Zealand! Mike, Guy and the other guys at Cartel Works have done great work keeping the Frazer Nash in good shape. I'm ready to go back! More photos - with a narration - in an old-fashioned "slide show"!